Much due to the fact that baccarat has, perhaps, one the most complicated rules, in comparison with other gambling games, most players, especially as far as the beginners are concerned, definitely need a set of basic tips in order not to get confused at the gambling table. 1. There's no winning baccarat strategy. The most essential thing for all players to remember is that within baccarat history, it has always been the game of luck. Therefore, one shouldn't believe anyone saying that there exists a certain strategy, which will increase one's chances to win. 2. Learn baccarat rules. In order to notice other player's mistakes, and some of the dealer's ones as well, it's absolutely necessary to grasp all the game's rules and keep them in mind. Despite the fact, that these may seem too complicated at first sight, once the player clearly understands them, everything seems rather simple, and when it comes to versatile baccarat variations, they can easily be played, too. 3. Play with fewer card decks in usage, if possible. According to baccarat rules, the game is generally played with 8 packs of cards, still, there happen occasions, when fewer decks are used. Such cases presuppose a greater advantage of winning, if betting on a "Banker", so the player shouldn't miss his/her chance to make the right bet. 4. Mostly, bet on a "Banker". Although casinos usually take 5% -commission from each "Banker's" winning, and the house edge for such hand is 1.09%, it still turns to be more beneficial to bet on "Banker". That's so as, according to statistics, 4 bets of such kind out of 7, tend to win. 5. Don't bet on a "Tie". It has been proved, that the "Tie"-result of the game is unbelievably rare. 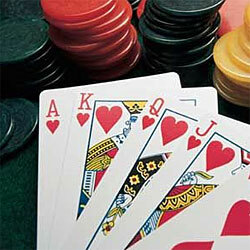 In particular, by betting on it, the player generally gives away about 14% of his money away to the casino. 6. Follow positive progression systems in bankroll management. In order to avoid spending more money, that it has been planned beforehand, it's better for the player to follow a simple scheme: having won a hand, one should raise his/her next bet by 50%, whereas having lost it, one should go back to his/her initial betting value. In a whole, when it comes to baccarat, everything is decided by luck. Therefore, by following the above-mentioned tips, one can at least reduce his chances to lose to a certain extent. At the same time, the most important thing, or even a tip, if you wish, is to receive pleasure from the game. Otherwise, there's no point in gambling, after all.